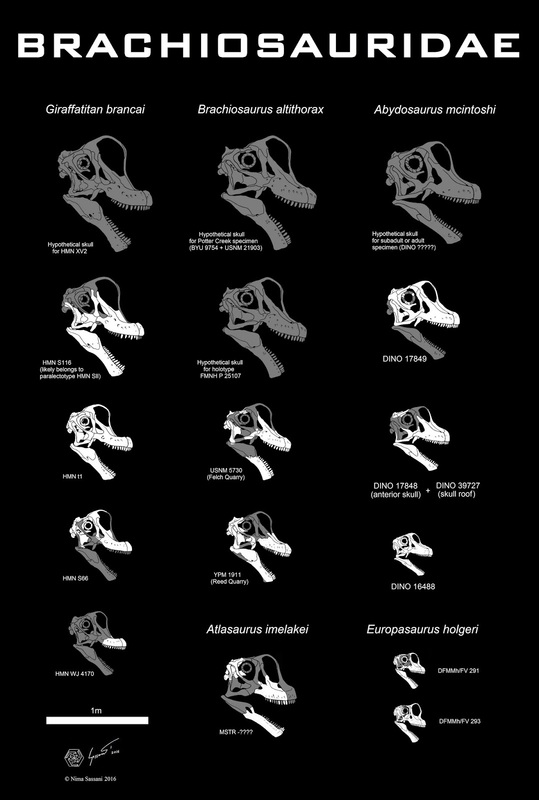 In the last post on Giraffatitan, we focused on just how strange the head is, and explored some hints about the ontogeny of the animal's face. 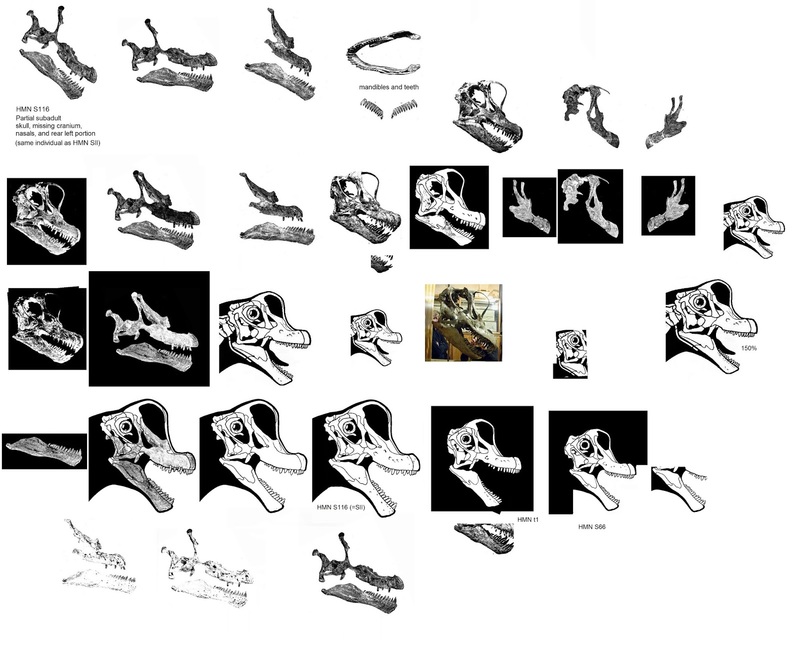 However after a deeper exploration of the actual fit of the skull bones, dumping all stylizations and previous conventions of illustrating this iconic brachiosaur, a few things started dawning after being hidden and dissociated for mission of years. Giraffatitan is even weirder than I thought last time. Not that it's easy to tell from three fragmentary skulls and a fourth that, while largely complete, has undergone massive distortion from crushing. 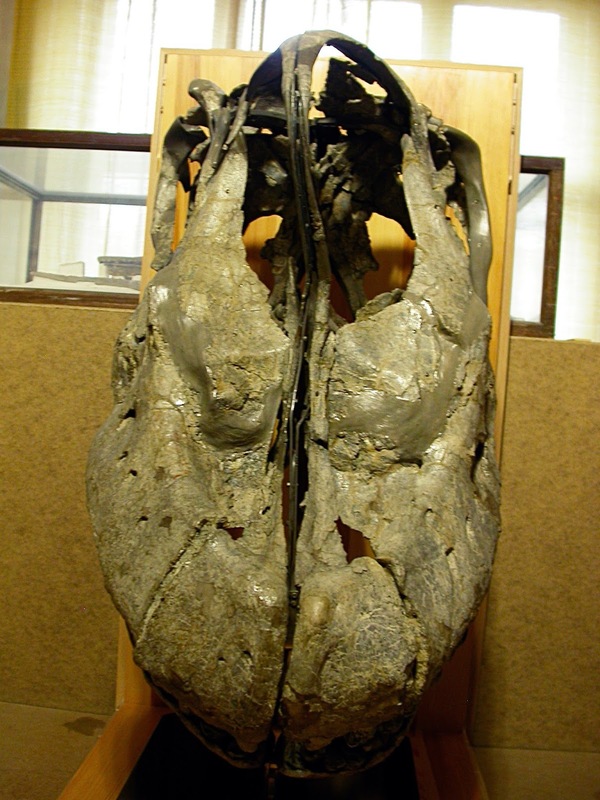 That skull, HMN t1, which was reconstructed in the 1930s, was cast in fiberglass recently by Research Casting International (RCI) in their 2007 revamp of the Humboldt Museum's dinosaur hall - one that was long overdue. 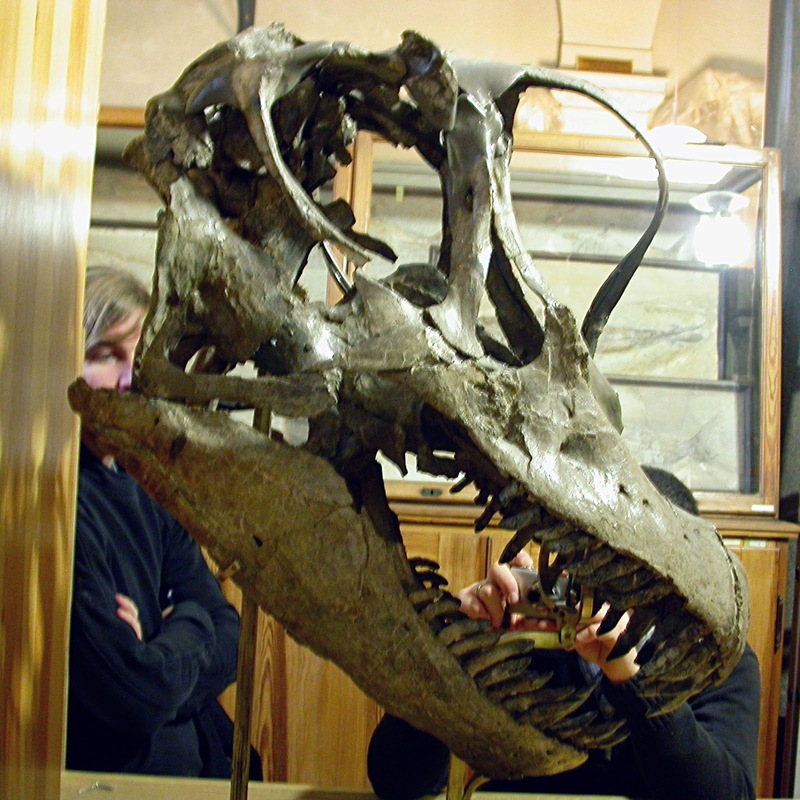 The cast was scaled up by around 15% or so on a 3D printer to match the body of the larger HMN SII, whose associated (and far less complete) skull SMN S116 was significantly larger than HMN t1. Apparently an earlier cast of HMN t1 existed as far back as the 30s and stood in a glass case in front of the old mount. The problem, of course, with HMN t1 is the crushing and distortion, which results in an asymmetric skull today. From the sides the distortion is more apparent. Left: moderate vertical crushing in the upper jaw. Right: more severe crushing in upper jaw, including lateral splaying of the lip region and artificial progmathism and splaying of the premaxilla and snout tip. This actually results in a different observable lip line on one side than on the other. Of course the teeth are seriously falling out of their sockets here. They did not extend out that far in life. Another problem is that the warping and crushing is in more than one direction, so that you are literally getting a different face looking at it from different angles. Judging the ideal "shape it should be" from a few photos at odd diagonal angles is asking for trouble. So how do you reliably uncrush this thing evenly, without photographic distortion on top of physical distortion, and get an idea of what the skull originally looked like? Well you can go based on photos by amateur photographers from slightly off angles in a small cramped basement room, or go by professional drawings from the past, or use published photos. I prefer published photos from the paper, but for Janensch (1935) these are rather old and grainy, and I assumed a better result could be had from bigger, newer, sharper full-color photos, or from supposedly well-measured professional drawings of the skull in its hypothetical pristine form. So I literally redesigned the skull four different ways before getting something that I could feel reasonably satisfied wasn't based on distortions and actually looked natural, like the interior of a living face, not some emaciated plastic toy. Something that didn't look out of place on an appropriately fleshed out Giraffatitan. The first version was on the old Giraffatitan skeletal I posted. The drawing I used for inspiration (artist unknown) was rather grainy, and I ended up exaggerating the proportions and the shape of the teeth somewhat. On a 1950s brachiosaur drawing this head may have looked okay, but the shape of the nose and the jaws just seemed contrived based on what I had seen of the skulls - and the snout was a bit too beak-like in profile. The second version came to me after hunting down a photo from a not-quite-profile angle on the web. Upping the contrast and then editing out the further premaxilla yielded a good snout profile, and this time with the nasal arch editing looking much better. The nasals of HMN t1 do appear a bit flattened so will need to be edited each time. Here the angle itself helped counteract the appearance of the crushed snout that plagues ride-view verbatim restorations.We end up with more robust jaws and a more believable gumline for a brachiosaur. But still, this image was based on a photo from an angle and so necessitated some distortion due to perspective as well. Out of frustration some may resort to simply taking Janensch's drawing of a "de-crushed" composite skull as the true path. The problem here is that Janensch made a glaring error - the snout in his engraving is far too long. I shortened it a bit, but even then this version seems to shrink the nose and the rear skull and overgrow the snout and jaws. 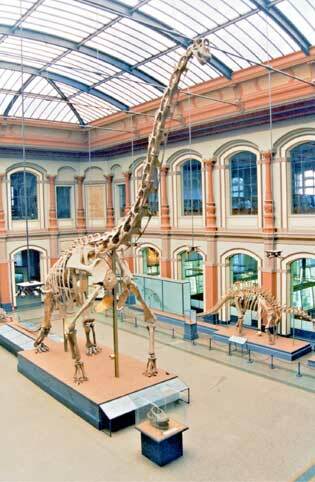 None of the Giraffatitan skulls have these proportions, they all reflect proportionally shorter jaws than that. Finally a real edge-on profile photo of the right side of the skull surfaced on the internet. It was poorly lit and grainy, but it was the best profile available at the time - the picture was taken from some distance, so no "fish-eye" shape distortion, and also no angle distortion. Of course the crushing was still there, but now there was no extra visual illusion on top of it to undo. Rapidly this became a line-drawing, but then the flattened upper jaw and prognathic snout tip had to be corrected. With the jaws deepened to make up for crushing and possible erosion, the teeth back in their sockets, and the back of the skull at its proper proportions, this fourth attempt looked like the answer. 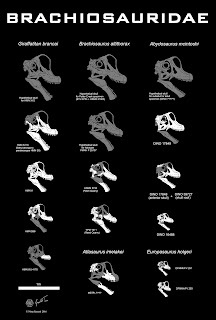 Based on it, I crafted the previous incarnation of the ontogenic sequence of Giraffatitan skulls, with some more modification. Unfortunately, this assumed the other skulls were more or less identical to HMN t1. And it also utilized an excessive amount of morph change from the original despite compensation for crushing being necessary. A better photo was needed. Actually several better ones were needed for these skulls turned out to be unique individuals with different faces. Looking closer at photos of the skulls, it became clear that this little happy family just looked wrong. The largest skull, HMN S116, does not look like an exact copy of HMN t1. It is clear we are seeing one species here, but there is individual variation, ontogenic variation, and maybe even some sexual variation. Just looking at the individual skulls and fragments, this is not readily observable. But just wait til you try to reconstruct the gaps. It is often helpful to invert colors in MS Paint and work "in negative" - it allows you to avoid distracting and potentially artificial structures and visual illusions caused by too many changes between black and white regions. 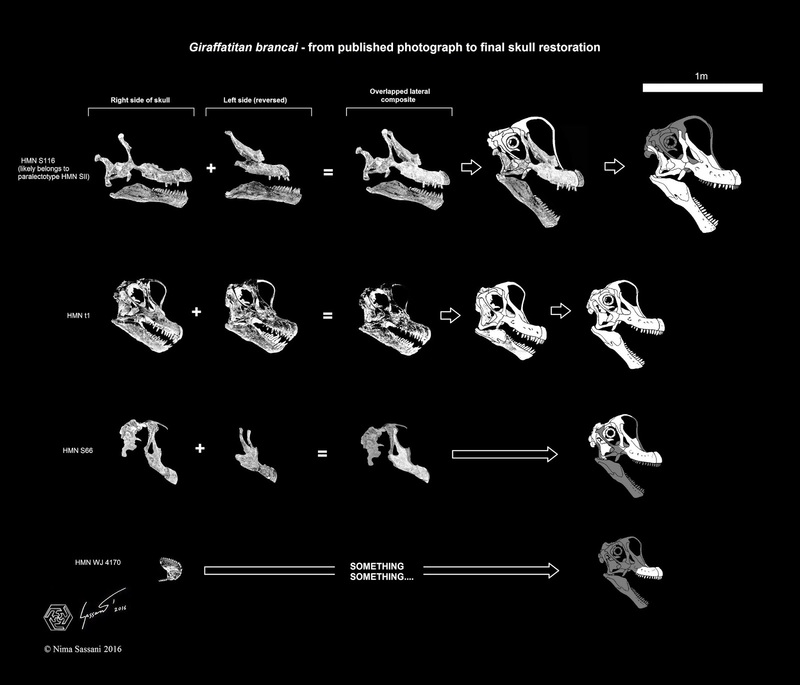 Now the process of following the skull photos much more closely than in the last set of reconstructions becomes very simple. 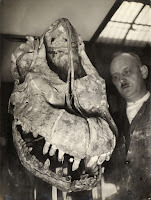 The published photos from Janensch (1935) are rather grainy compared to more recent ones, but at least they were taken professionally, from proper lateral angles at a good distance, and thus can be used to make a skull recon while both removing crushing and avoiding the pitfalls of having to worry about camera angle distortion from amateur photos of the skulls (or of t1 anyway, since the other skulls have never been reconstructed or cast, and are off limits to the public). Reversing one side of the skull and overlapping it in Paint and Pixia allows you to get an idea of the relative crushing and distortion in different directions on both sides of the skull, and average their outlines to compensate for it. Some additional decrushing was also done with the snouts, which were all a bit more flattened than normal. So in the end we have a rather different set of skulls than the speculative versions in the last post. Interestingly enough, the large HMN S116 has an absolutely huge nose, even by the standards of the more famous HMN t1. 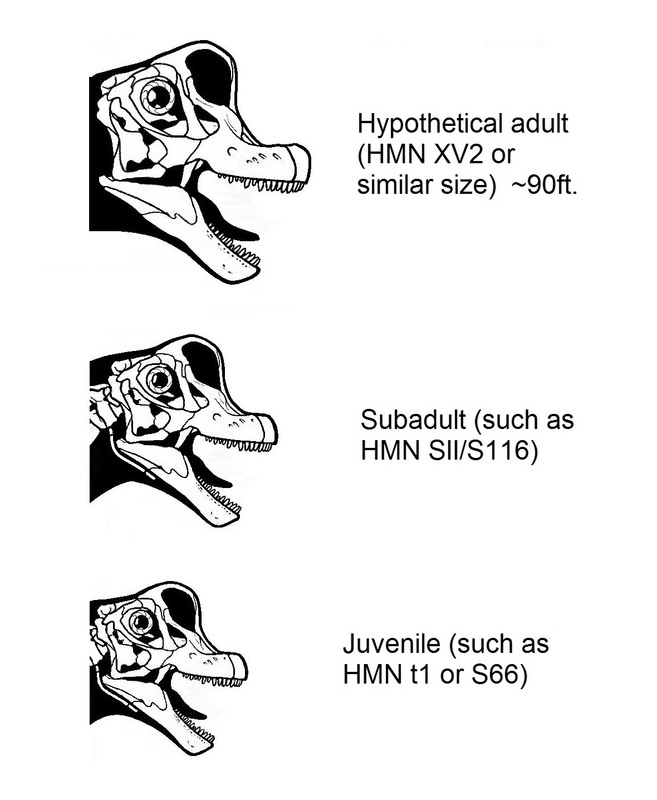 While the nasal arches are not preserved in S116, the enormous and massively buttressed shape of the upper maxillary process means that the nasals begin higher up on the skull than in HMN t1. 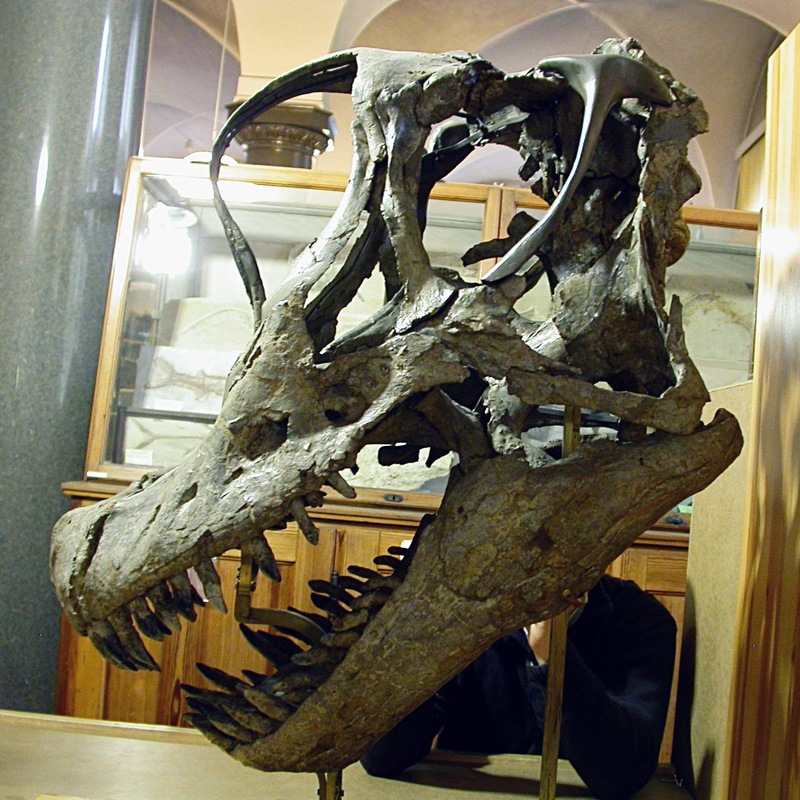 In addition, the higher slope of the maxilla's upper surface indicates the nasal arch was also more elongated from front to rear (relative to the snout) than in t1. This overall indicates a nose that was oversized in all dimensions relative to t1. The lower jaw by contrast seems a bit undersized. 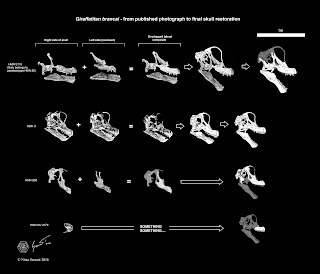 This can be easily explained as the result of ontogeny, as the large S116 - probably the same animal as the huge mounted postcrania labeled HMN SII - is actually still growing, its coracoids being unfused to scapulae, though it is still more mature than the smaller t1. However, there is probably more to this bulbous difference in nasal size than just ontogeny. 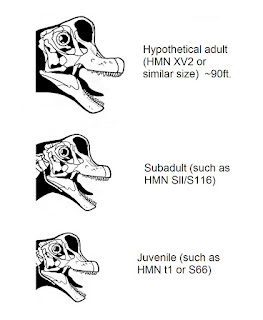 Note that the immature HMN S66, which is smaller than t1, also shares the large S116's trait of very large and tall upper maxillary processes and thus nasal bones that are rooted very high on the head. 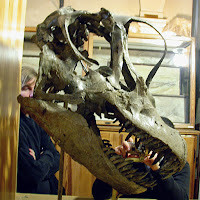 The nasal of S66 is flattened, which is to be expected as it has disconnected from the premaxillary (whose upper portion, making up the lower half of the nasal arch, has long broken off and disappeared) . However judging by the high-sloping upper surfaces of the maxillae in this specimen, the full nasal arch was likely also proportionally taller and longer than in t1. The fact that both the more mature S116 and the slightly smaller and (likely) less mature S66 have significantly more massive and taller upper maxillary processes and larger noses overall than t1, as well as a different shape to the maxillary processes altogether, indicates we may actually be looking at sexual dimorphism - perhaps with the large S116 and the much smaller S66 both being males, and the intermediately sized t1 being a female. This possibility indicates that dimorphism in Giraffatitan could have progressed, at least in the skull, from a relatively young age. HMN SII/S116 was roughly 74ft. long, even with the substitution of the smaller correct tail HMN Aa for the oversized tail "HMN Fund no" used in the mounted exhibit. Judging by the unfused coracoids (and overlapping unfused scapula from the similar-sized HMN Sa9 - which may also be part of the same individual), the animal was likely a subadult, perhaps in its tens or early 20s assuming these animals took around 30 years to reach adulthood, which seems to be the indication in osteological sauropod studies. HMN S66, by a very rough estimate, was probably around 50ft. long, and may have been in its early teens. 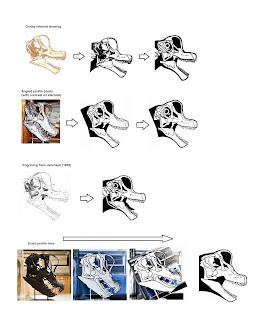 Unfortunately there has not been much histological work done on Giraffatitan to determine the ages of various specimens so these are speculations for now, but it is likely that if we are seeing sexual dimorphism in skulls, it probably began well before Giraffatitan reached physical maturity. Of course, adult Giraffatitans (of which HMN XV2 and "HMN Fund no" may be examples) would have had even bigger heads. As these larger specimens, likely ranging between 85 and 90ft. long when alive, are not known from shoulder material, whether they are full-grown or not is impossible to determine. 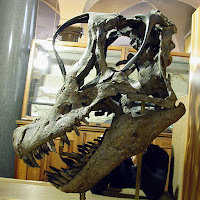 So the typical adult size of Giraffatitan - let alone its upper limit - is not determinable with any certainty, and neither is its maximum likely adult skull size. But we can at least scale up S116 to get a rough model of how big XVs's skull may have been. Yes, those are some pretty huge skulls. And it makes sense, as they needed a big head, and especially a big mouth, to pack down all the food needed to grow to such huge sizes and beyond. HMN XV2 could have taken in 30gk in a single bite (though given how Jurassic conifer tendrils were built, much of each bite would have been air). And things get even stranger when you realize that even in the smaller HMN t1, the braincase was about 500 cc's, far larger than in many dinosaurs, and comparable to a chimpanzee brain, which is considered pretty large in terms of raw size. 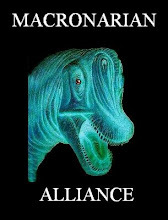 Nobody will ever see sauropods as "pin-headed" ever again. 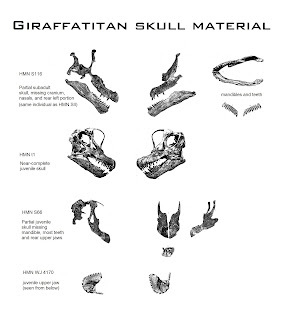 So to recap, not all Giraffatitan skulls were copies of HMN t1. There is significant variation, enough to suggest a possible dimorphism in addition to ontegenic changes. Thanks, that is good :) Would be nice if the DML discussed some of my ideas after this. Glad to see it has moved on from its old fare of acrimonious exchanges of pointless political fuming and personal attacks. I am Jens Kosch, now in the Zanno lab at Raleigh, NC, but previously I was at FU-Berlin and I wrote my Masters Thesis on the dentigerous bones and the dentition of Giraffatitan. But I don't like the fact that you ignore the currently valid collection numbers for the MfN specimens. You simply use Janensch's designations. I have one more question: do you know who, if anybody, actually published about the possibility that YPM 1911 is Brachiosaurus material? Paleolithic eating regimen design or basically Paleo eating routine arrangement which is by and large alluded to is really getting very famous and it's additionally viewed as one of numerous most solid eating regimen design out there.